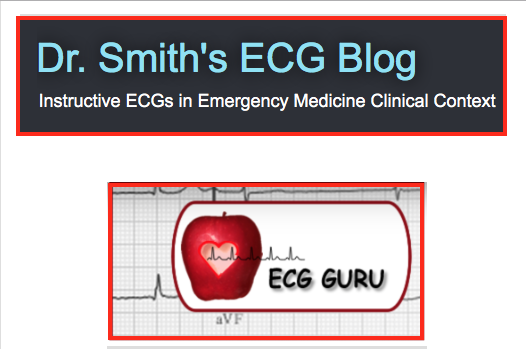 This is the 5th installment of my ECG Video Blog. 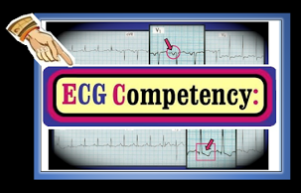 This 17-minute video continues a Clinical Look at Cardiac Arrhythmias from a Primary Care Perspective. 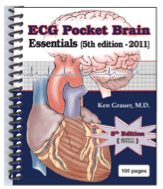 Focus in this Part 2 is on ventricular arrhythmias — and, on bradycardia including diagnosis of Sick Sinus Syndrome and indications for pacing. In the final part of this video series (Part 3 — coming soon!) 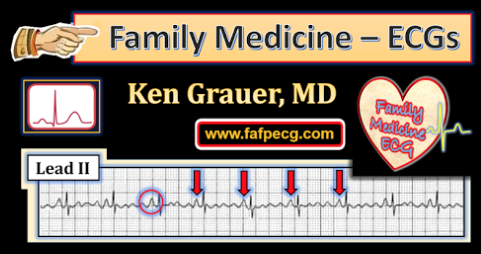 — We'll conclude with discussion of the SVT rhythms that are commonly encountered in primary care. Below in Figure 1 — a sample of some issues discussed in this Part 2 (Video-Blog #5 = Blog #99). I believe this video brings the topic to life! 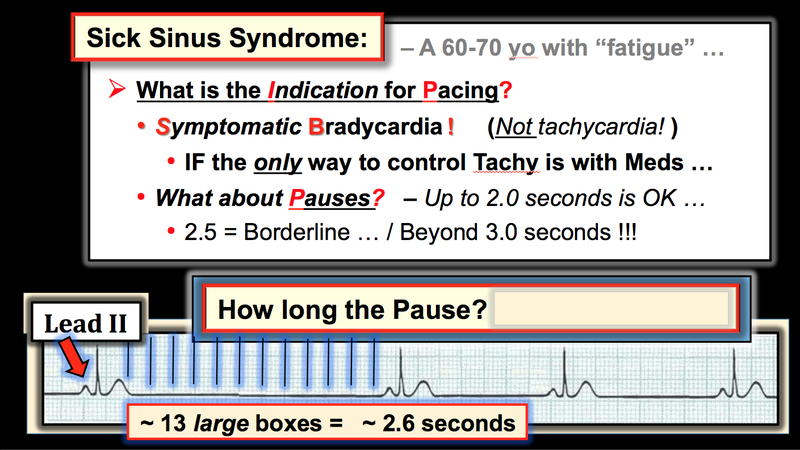 Figure-1: Slide discussing indications for pacing in Sick Sinus Syndrome, with illustration explaining the importance of pause duration. NOTE — Enlarge by clicking on Figures — Right-Click to open in a separate window. 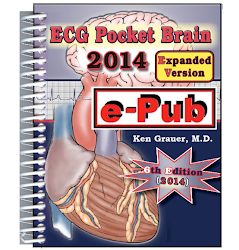 GO TO: https://www.youtube.com/watch?v=8n8PEYLb1hg — on YouTube to view this ECG Video (17 minutes). 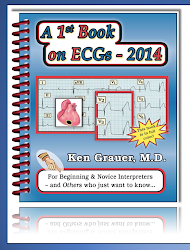 This is the 4th installment of my ECG Video Blog. This 26-minute video provides a Clinical Look at Cardiac Arrhythmias from a Primary Care Perspective. Focus in this Part 1 is on monitoring methods — the importance of the clinical scenario — and determining whether the rhythm is likely to be benign vs a rhythm that should be referred. In Part 2 — We'll apply these principles to a rapid overview of the arrhythmias most commonly encountered in primary care. 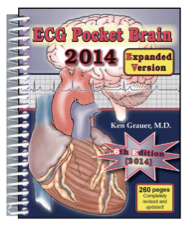 My goal in this brief video series is to address the "art" of arrhythmia management from a primary care perspective. 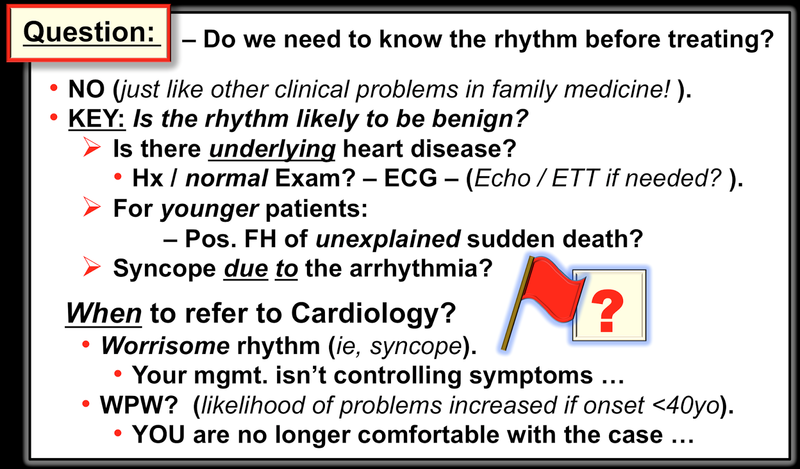 This includes cost-effective assessment as to whether a rhythm disturbance is present (with details on monitoring methods) — whether the arrhythmia is likely to be benign or more worrisome — and a practical approach to treatment. Figure-1: Slide discussing clinical assessment as to whether an arrhythmia is likely to be benign — and whether referral to Cardiology (or EP Cardiology) is indicated. NOTE — Enlarge by clicking on Figures — Right-Click to open in a separate window. 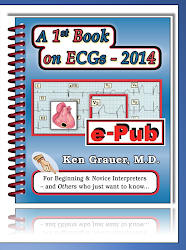 GO TO: https://www.youtube.com/watch?v=THJKEXZmA2k — on YouTube to view this ECG Video (26 minutes). 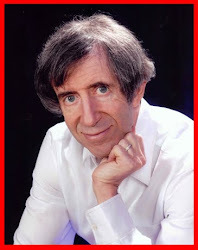 Click Here — for a Timed CONTENTS of Video-Blogs #4,5,6.